Melanie Jacobson, a PhD student in epidemiology, presented her research April 6 during the Three Minute Thesis Competition. Jacobson won the verbal competition with her concise explanation of her research into the effects of brominated flame retardants on thyroid function in vulnerable populations. Doctoral research is hard work. Presenting your work to a non-specialist audience in three minutes or less might be even harder. 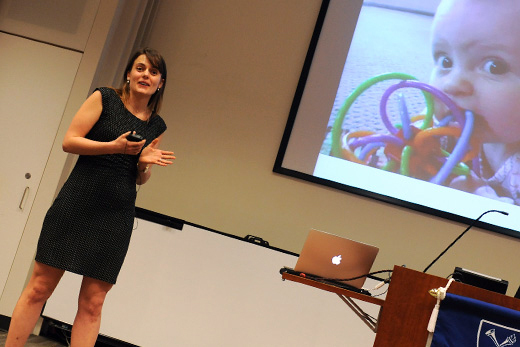 Each year, Laney Graduate School's Three Minute Thesis (3MT) Competition challenges students to do just that. The goal is to help students develop their academic, presentation and research communication skills so that they can consolidate their ideas and crystalize their research discoveries. Melanie Jacobson, a fourth-year PhD student in epidemiology, won the presentation competition at this year's 3MT, held April 6. We caught up with Jacobson to learn more about her work and her plans for the future. What drew you to the Laney Graduate School? I chose to pursue my doctoral education at Emory University, and the Laney Graduate School (LGS) in particular, for the strong teaching program in methods as well as for the opportunity to train with Dr. Michele Marcus, a leader in the field of reproductive and environmental epidemiology, with whom my interests are very well aligned. Furthermore, there is a strong emphasis placed on teaching and mentorship, and the culture prioritizes these interactions with students. You've just won the 2016 3MT verbal competition. Can you tell us about your research in 100 words or less? Brominated flame retardants, such as polybrominated biphenyls (PBBs) and polybrominated diphenyl ethers (PBDEs), are persistent chemicals that are used in the manufacturing of many consumer products, and are ubiquitous in the environment and in human media. My research examines the effects of exposure to PBBs and PBDEs on thyroid function and its sequelae among two highly exposed and vulnerable populations that have not previously been studied: young children and reproductive-aged women. Beyond investigating the thyroid impacts of exposure to these common environmental chemicals, this research will also contribute to our understanding of how thyroid function influences menstrual and reproductive physiology. How did you arrive at this interest/research topic? I became interested in environmental epidemiology through working for a toxic tort plaintiff law firm after I earned my MPH at Tufts University. As a consultant epidemiologist for this environmental firm, I investigated health outcomes in communities affected by contamination, including most notably the Deepwater Horizon oil spill. When I matriculated into the PhD program at Emory, I was interested in the effects of environmental exposures on vulnerable populations — and specifically women’s and children’s health. From there, my mentors, Drs. Michele Marcus and Lyndsey Darrow, were instrumental in helping me to conceptualize and develop this research proposal. The 3MT competition is a fierce exercise. Why did you decide to give it a shot? I think it’s important for scientists to be able to explain their research to different audiences, and not just those with technical training. Furthermore, I think this is especially important for scientists working in public health. I want my work to be relevant and understandable to communities, other interested parties, and the public at large. Why is it important for this type of programming to be available? LGS programs and support have been instrumental to my success, learning and development at Emory. For example, through using Professional Development Support Funds (PDS), I have been able to attend many conferences and present my work with colleagues in the field over the last four years. I was also awarded PDS competitive research funds, which contributed to my academic success by funding some of the thyroid assays I needed to run for my dissertation research. Lastly, I completed the doctoral ethics training through the Jones Program in Ethics, which has enhanced my understanding of the ethical implications of my research, as well as the TATTO program, which provided me with a strong foundation of teacher training. These experiences have not only enabled me to become a productive member of the Emory community, but have provided me the opportunities to build essential skills and training upon which I will be able to launch a scientific career in the future. I hope to pursue a career in research – but have yet to decide if that will be in a government, academic or private setting!